A seasonally changing menu in a rustic canyon setting. : The scenic backdrop of Millcreek Canyon sets the tone for this restaurant's sophisticated cuisine. 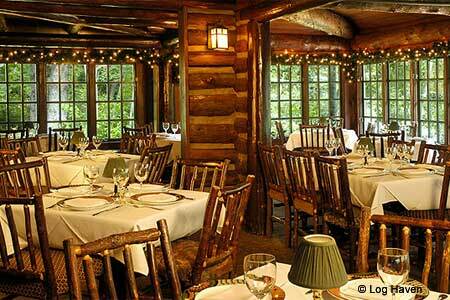 Built in the 1920s, the lodge is like a cozy skier's hideaway, with nature playing the featured role inside and out. The menu changes seasonally in an attempt to reflect the natural setting and maintain the romantic fine dining atmosphere. We've enjoyed the blackened bison teres major steak with candied pancetta and cipollini onion, as well as the honey-grilled organic chicken and smoked duck with serrano chile pasta in chipotle butter. Save room for the blonde chocolate tart with huckleberry sauce and then walk off the calories during a post-dinner stroll around the pond.